You can control which customers enter your triggered campaigns with the segment or event triggers. But sometimes you might want finer-grained control than that. 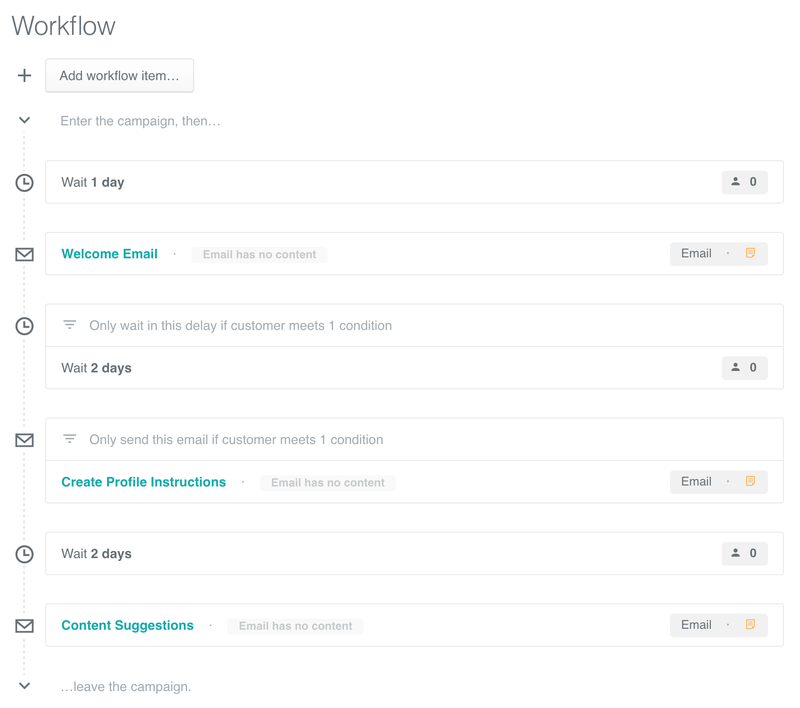 Choose exactly how customers run through your workflow with Action Conditions. How do Action Conditions work? Action Conditions are optional checks you can add to any delay or action in your campaign. The conditions are checked against the customer just before entering the delay or performing the action. If the Action Conditions are not met, the action is skipped, and the customer continues on through the campaign. If you&apos;d like them to leave the campaign entirely, use campaign-level filters. When should you use Action Conditions? There are many more possible use cases, some we haven&apos;t even thought of yet! This will open up the conditions editor. You can add up to four conditions, based on customer attributes or segment membership. Click Set Conditions, then save your action to enable the conditions. If you want to see which conditions the action has, mouse over the filter icon on the left for a quick popover. Welcome Email: Thanks for signing up! We want to send these three messages with 2 day delays between them. But with a normal campaign workflow, there&apos;s a small problem. What if someone signs up, then sets up their profile within two days? They&apos;ll receive a useless "How to set up your profile" message. This way, if someone signs up and quickly sets up a profile, they&apos;ll receive the Welcome Email, wait two days, and then receive the Content Suggestions email. They skip Create Profile Instructions and its delay entirely. Any questions or comments about Action Conditions? Drop us an email!